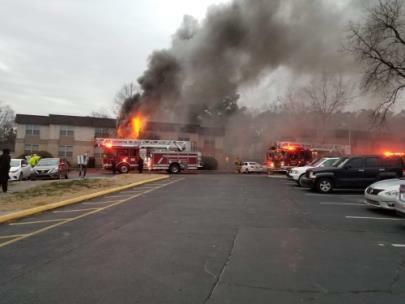 A fire broke out at Evergreen Apartments on Hickory Valley Road when fire broke out at approximately 6 p.m. on Tuesday. Robert Knowles said he had just gotten home from work and was walking to his apartment in the H Building when a woman ran out of her apartment across from him carrying two babies in her arms. He said he could see fire toward the back of her apartment. Mr. Knowles said he helped her down the stairs and then went knocking on every door in the building to alert all of the residents. Mr. Knowles also said he used up to five portable fire extinguishers in an effort to put the fire out, but was unsuccessful. The Chattanooga Fire Department initially responded with six fire companies to this fire. However, when firefighters with Quint 8 confirmed they had flames visible, Captain Ed Jackson requested a second alarm response to bring in extra personnel and equipment. After confirming that everyone was out of the building, Captain Jackson said his firefighters attacked the fire aggressively with hand-held hoselines and had most of the fire out in roughly 10 minutes. Before being extinguished, some of the flames had penetrated into the roof above, so the firefighters had to cut and dig into the layers of the roof to put out hot spots. No injuries were reported. An estimate on the loss was not available, but most of the apartment units were spared any fire damage. Two or three units on the first floor will likely have water damage. The building has 10 apartment units with 30 to 40 residents. With power cut to the entire building, those residents will most likely have to stay elsewhere Tuesday night. Volunteers with the American Red Cross were called to the scene to work with Evergreen Apartments management to make sure all of the residents have a place to stay. The cause of the fire is under investigation. Chattanooga Police, Hamilton County EMS, EPB and Chattanooga-Hamilton County Rescue also provided assistance on the scene.